A low budget lacklustre sci-fi with uneven performances, sloppy direction, uneven editing and a multitude of plot holes. So bad, it’s oddly good! 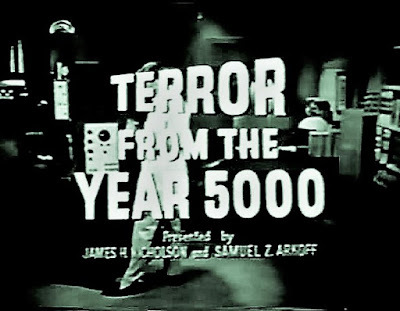 The 1958 independently made American black-and-white science fiction film, Terror from the Year 5000 (a.k.a. 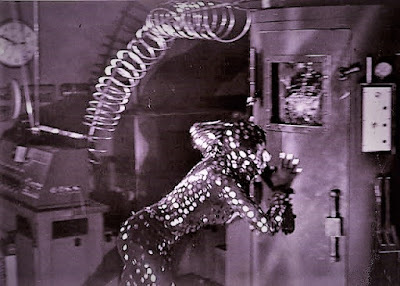 Cage of Doom in the UK) was produced by Robert J. Gurney Jr., Samuel Z. Arkoff, James H. Nicholson, and Gene Searchinger. It was directed by Robert J. Gurney Jr., and starred Ward Costello, Joyce Holden, John Stratton, Salome Jens, and Fred Herrick. 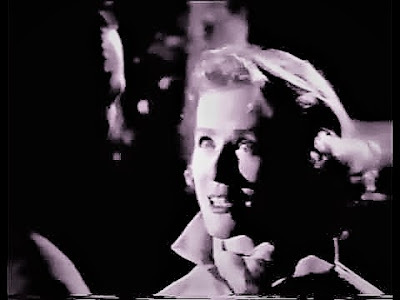 The screenplay was based on the short story Bottle Baby by Henry Slesar, that was published in the science fiction magazine Fantastic (April 1957). 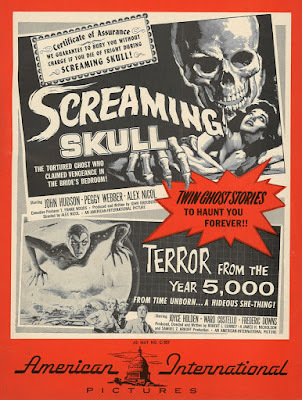 American International Pictures released the film on a double bill with The Screaming Skull. The story involves Prof. Erling and his financial backer, Victor who have constructed a prototype time machine which they use to obtain various objects from the past. 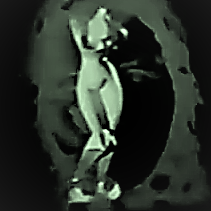 On one occasion they discover that one item - a modernist Venus de milo-like statuette – that materialized in the machine, radiometrically dates to the year 5200 AD! It turns out that 20th-century objects that are placed in the machine appear to be "traded" for objects from the future by someone or something. 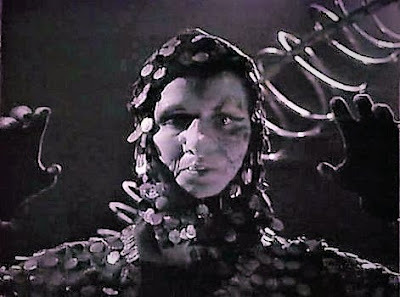 It also transpires that Victor has been secretly trying to get a living intelligent specimen from the future to materialize in the time machine. What present danger is humanity faced with now! Directed by Robert J. Gurney Jr. In an odd little basement bookshop located in an obscure little corner of New York City, a bald bespectacled middle-aged man pries out a dusty old book from a crammed assortment of equally dust-clad printed material dealing with a variety of esoteric subjects. Needless to say, Professor Erling’s time experiments and his published account of them were roundly ridiculed by the scientific community. As the current new owner of the long-forgotten text emerges from the twilight solitude of The Ol’ By-gone Book Shoppe and steps into the taut turmoil of the modern metropolis, his mind meanders through corridors filled with thoughts of TIME. While moving from point A to point B, Professor George Wells’ mind traverses in an instant the space between the now and the many occasions in the “past” when he devoured any material concerning the theories and possibility of time-travel, as well as related subjects. From the early ideas of Hermann Minkowski to Einstein’s theory of relativity; from wormholes to blackholes and from Cosmic String Theory to the concept of a Multiverse, the ravenous mind of Professor Wells greedily gobbled them up. Nothing on the subject of TIME had escaped the professor’s notice, even seemingly absurd publications like the one he is clutching tightly under his arm as he opens the door to his apartment. The following excerpts contain spoilers……. …….“In the year nineteen hundred and forty-seven, man broke through the sound barrier!.....In the year nineteen hundred and fifty-eight, man launched the first satellite and pierced the space barrier!.....Now, in an isolated area of central Florida, man struggles to penetrate the most imposing barrier of all!.... the time barrier!” And from the very pages of this book, I shout out to the world: that man was I, Professor Howard Erling, nuclear physicist, who has throughout his life resolutely set himself the task of probing “relentlessly into the future!”……. How I wound up on my Florida island began with a local newspaper report that my “theory about crossing the time barrier was ridiculous.” It was this article that got me “disqualified from doing top-secret work,” so the missile centre where I worked fired me! Working in the isolation and privacy of my Florida island estate, I struggled “to penetrate the most imposing barrier of all!” I finally managed to construct a machine that broke the time barrier itself. With the help of my financial backer and assistant Victor, I performed a number of experiments culminating in the successful transportation of a small statue……from the future! Unfortunately, the temporal transportation process required vast amounts of energy. Also, our work required outside verification from another professional colleague. With this in mind, I called a halt to the research, much to Victor's chagrin and disappointment…….. I had quite a heated argument with Victor who desperately wanted to move forward. I fully appreciated the fact that he was bankrolling the experiments but it was obvious that it was “more for personal than scientific reasons!” Nevertheless, I had accepted Victor’s money on the condition that I would be the one who made the decisions. I then arranged to send the statue we received to archaeologist and museum curator, Robert Hedges for his appraisal and determination of its true age. …..Supposedly as a result of a mix-up with communication and transportation and delivery of the statue, Dr Hedges received a telegram purporting to be from me stating: “Do not understand why you have not returned my letters [stop] You have proof that I am not insane [stop] Please establish date of origin of statue to your own satisfaction [stop]”……. …..Unable to reach me by phone, Bob flew out to Florida to see me personally. He told me later that upon leaving the airport he realized that he was being followed. After a hair-raising pursuit, Bob came to a halt, got out of his car and confronted his pursuer only to discover it was my daughter, Claire who was also Victor's fiancée. She went to meet him at the airport but had just missed him. It was in fact Claire who sent the statue to Bob to speed up the verification process. …..It was Bob Hedges who provided a clue as to something being wrong with the experimentation process. I informed him that Victor and I had stopped our experiments when we found out just how radioactive the statue was. Bob then told me that he thought I must have been operating the machine when the motorboat’s motor cut out. I insisted, however, that we had not touched the time teleportation machine since we received the statue. ……I learned later on that night, that Bob heard Victor enter the guest room next door to the room they were sharing and followed him as he opened up a chest of drawers and removed two metal suitcases. Victor then proceeded to take the suitcases outside where he threw them into a pond. I also later learned that while we were preparing to retire for the night, Victor apparently had re-entered the lab to continue his time experiment by increasing the power levels. Unbelievable as it sounds, it seems that the higher power level enabled a human being from the future to materialize in the machine! Victor did manage to return the figure to the future, but sustained a nasty gash on his arm when the being grabbed him. ……When Bob told me about Victor's strange behaviour the next morning, I wouldn’t believe him until he could provide evidence. I told him I was “disappointed” in him for making up “wild accusations against Victor” and that his obvious interest in and involvement with Claire had caused him to lose his “objectivity.” Bob then returned to the pond to retrieve the suitcases, but Victor managed to intercept him and attempted to stop him. A fight then broke out between the two men and when Claire and I arrived on the scene, Bob revealed Victor's badly injured arm – burned by radiation……. ….We had to do a bit of persuading to get Victor to the hospital. I was particularly concerned about the “secondary radiation” he received. When we did eventually get Victor to the hospital, the doctor asked us to return in a few hours’ time to give him a chance to examine him properly. 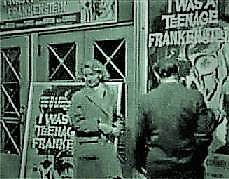 ….It turned out that while Claire, Bob and I were taking in a movie (“I Was a Teenage Frankenstein”), Victor left the hospital and wound up at a bar which he eventually exited – or was helped to exit - in a somewhat inebriated state. He then returned to the island and broke into the lab in order to work on the machine using the higher power levels…….. …..When Bob, Claire and I stopped off at the bar, the bartender informed us that Victor had been there most of the afternoon. Suddenly, we noticed that the bar's television reception had cut out. Bob declared, “Let’s not get all jumpy because a TV set goes on the blink!” However. 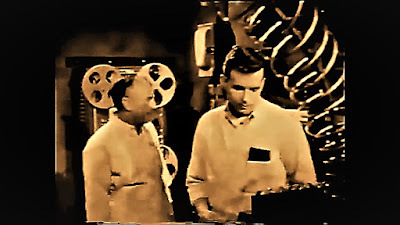 I knew then that Victor had started operating the time machine which creates “a distinctive pattern of interference” and that someone, namely Victor, had been operating the machine at “a higher voltage than ever before!” ……. As we drew nearer to the island, Claire noticed the lights were flickering on and off at the house. I felt that Victor would succeed in blowing out the generator. Unsurprisingly, the motor on our boat cut out and died. Not for long, however, since Victor had managed to blow all the fuses allowing the boat’s motor to start again. When we got back to the island, we found Victor in a semi-conscious state. He had apparently succeeded in materializing a human female from the future, but was rendered unconscious by his mysterious guest. I quickly ordered my what some may call “chief cook and bottle washer,” Angelo to contact a doctor. When he eventually came out to examine Victor, he arranged for a nurse to come out later and care for the patient. ……With the time traveller roaming around the island, Bob managed to retrieve one of the metal suitcases from the pond, which contained the body of a four-eyed mutated cat……. Soon after, Bob and Claire came upon the dead body of Angelo who had obviously been killed by the woman from the future. Upon examining his body, I concluded that Angelo had the same kind of burns as Victor. …….We then went to Victor’s room, where he informed us about his secret activities. He told us that after he brought the deformed cat through, he thought he was really on to something significant. Victor then went on to say, “I thought that I had contacted savages…..and that cat was something their witch doctors had made.”……..
……There was still the matter of the Nurse coming out to the island to take care of Victor. Also, since the woman from the future had committed murder and was obviously dangerous, it would be necessary to stop her from getting off the island……..
…….It appears that later that evening, as the nurse approached the house, she was accosted by the woman from the future who attacked her. 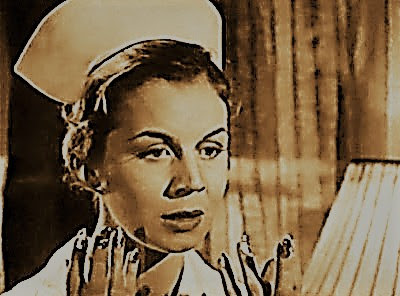 It turned out that this mystery woman was able to pose as the nurse by using a rubber-like or synthetic face mask which she placed over the nurse’s face. 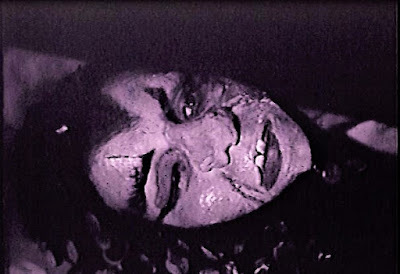 By the application of some advanced technology, she was then able to place the mask on her own face and therefore have the same facial appearance as the nurse. Meanwhile back in the house, Bob and I heard some screams and decided to go and investigate. I thought it prudent for us to put on anti-radiation suits. At that point the nurse arrived and while she sat with Victor, Bob and I put on our radiation proof gear and went out to search for the time traveller. …….It appears that somehow our time traveller managed to hypnotize Victor with the intention of getting him return with her to the future in order to use his healthy genes to save her people from extinction. Perhaps too many of their young were born mutants due to the high levels of radiation. It seems that only with “new blood, with undamaged pre-atomic genes” would the human race be saved in the future……. ……While Bob and I were outside making use of a Geiger Counter, Claire burst in on Victor in the lab just as he was putting on his radiation suit. Victor yelled out to Claire, “I’m going into the future! I must go!” As Claire attempted to get him to go back to bed, the woman from the future jumped out and a confrontation ensued between them. …A physical altercation erupted between my daughter and the woman in which Claire accidentally ripped off the latter’s mask and revealing her radiation-scarred features. If this is what the future holds for humanity, then what is it we are doing right now that could lead to such a fate for the human race? Professor George Wells closes the book and turns his gaze toward the window as the last rays of this day’s setting sun wearily wanders along the top half of the wall before disappearing into a corner of the ceiling. After switching on a floor lamp, the professor switches on his turntable and takes out a vinyl album, the Beatles “Let It Be.” He selects a track, John Lennon’s “Across the Universe” and sits back down in his chair. 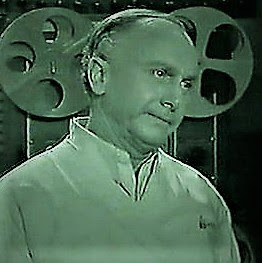 As the music washes over him, Professor George Wells thinks about the cosmic turntable upon which the album containing everything that exists is placed. On that album can be found the time tracks of our lives, with each track representing a different time-period. Each time-period we cross over to exists simultaneously on our album and on the infinite number of albums we could choose to play. No matter what album is played, the same cosmic turntable exits with its figurative pre-set speeds of 33 1/3, 45 or 78 RPM. But what if we can intervene and circumvent the seemingly immutable laws of time and space? What if I could design a device that would allow a person to enter any time period at will? Let the turntable spin as it wishes for I would be able to go when and where I like! What if my device – my “Time Stylus” chamber – could capture an individual moment in a person’s life, that one micro-groove, and isolate it in a kind of stasis state? The Time Stylus chamber could then be used to extract that person and his individual life moment and deposit him in any time-period, as well as return him to his original point on the life-album. Nothing would change. The life album representing one reality would exist as it always has. Choices that could be made to change events and outcomes would simply be tantamount to selecting another album from the infinite collection available. The question of whether or not the future is what we make it; whether or not we can act to change it; whether or not the future is pre-determined of if there is indeed “A FUTURE” as such may soon be settled. But first, Professor George Wells must locate the last surviving participant of the events surrounding “The Terror From The Year 5000” –Erling’s daughter, Mrs Claire Hedges. If they still exist, it would she who would be in possession of her father’s plans for his time teleportation chamber. These plans will provide Wells with important guiding principles for the construction of his own time device. As Professor Wells drifts off to sleep. the stylus needle comes to the end of the last track. The turntable halts briefly and with a click the record player's arm automatically lifts and moves the needle over to the first track and the album starts over….. The film's outdoor scenes were filmed in and around Dade County, Florida. USA. 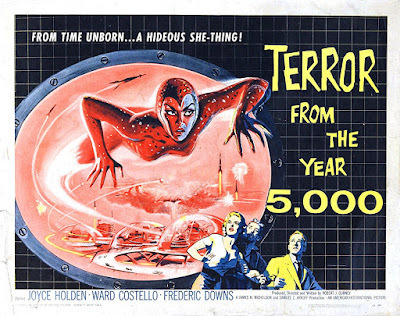 The working title of the film was The Girl from 5000 A.D.
Terror From The year 5000 was the first feature film credit for Salome Jens who plays the woman from the future and the nurse. Although it is stated by the film’s narrator that the first satellite launched by human beings was in 1958, it was in fact the Soviet Union who launched the first satellite with their Sputnik 1 on October 4, 1957. The first satellite launched by the USA was Explorer I, on January 31, 1958. As mentioned above, Carbon 14 dating does not work with metal or mineral objects and substances, but only on materials that were once living or part of a living organism such as wood, leather and bone. 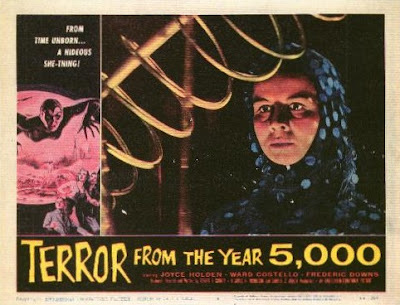 What is interesting about Terror From The year 5000 is that it was possibly one of the first American feature films involving time travel using a time machine. 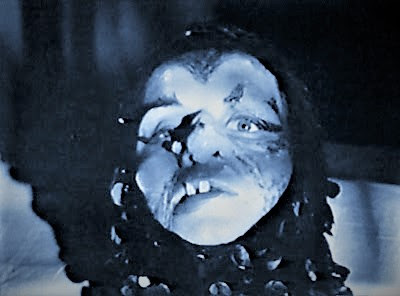 As with the film, The Astounding She Monster it is a rather disturbing notion to have a life-threatening, evil, radioactive female far removed from any role as a protective, care-giving and nurturing force. Equally disturbing is the idea of peeling off someone’s face to wear as a mask. That shock-provoking device may have given more than one youngster back in the day a few nightmares! Certainly, the film reflects the fears that were prevalent at the time concerning nuclear power, atomic weapons and the danger of atomic fallout, all within the context of mounting tensions between the East and the West. It also highlights the misconceptions about the nature and effects of nuclear radiation. Consider the characters’ rather cavalier and nonchalant attitude and behaviour when in the presence of radiation. Why create a lot of fuss, "just because that statue was a little radioactive?" And who knew? 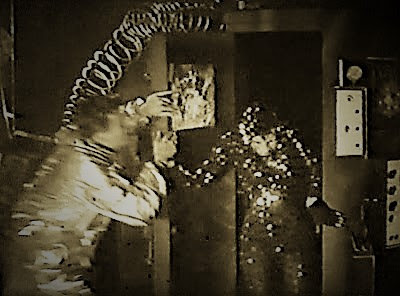 They actually had radiation proof suits which no-one considered wearing until well into the story! Hopefully our greater understanding of the effects of nuclear radiation these days will prevent certain political and military idiots of North Korea and the USA from embarking on a course of action too terrible to contemplate and with a consequence even time travel would not solve!